Work on the Metro Regional Connector is marching on. Beginning tomorrow, Saturday, December 2, from 8 a.m. to 6 p.m., traffic lanes at the 2nd St. and Spring St. intersection in downtown LA will be reconfigured in anticipation of a four month-long series of weekend street closures. This one day task will require a full intersection closure. Subsequently — from Friday, December 9, through March 2017 — the intersection at 2nd and Spring will be closed for pile and deck installation on weekends. The weekend closures of the intersection will begin on Fridays at 6 p.m. and last through Mondays at 5 a.m (except holidays). Local access to businesses and residents will be maintained. 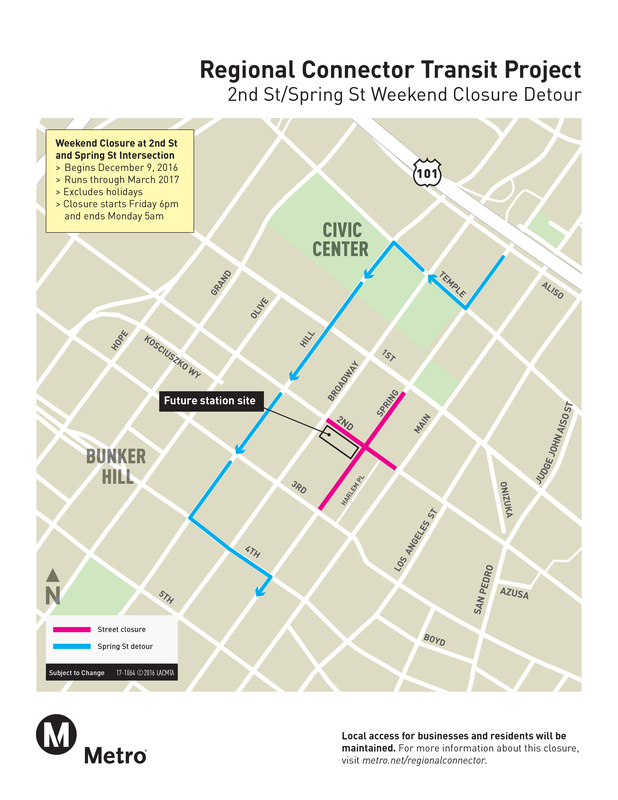 These street closures will extend on Spring Street from 1st Street to 3rd Street and on 2nd Street from Broadway to Main Street. Use Hill Street on weekends to avoid delays, as indicated in the detour map below. The roads reopen to traffic during the workweek. With these closures, the project will build a temporary roadway that will permit traffic to flow uninterrupted while crews excavate the future 2nd St/Broadway Station box and tunnel, as well as protect existing underground utilities next year. Learn more on the project’s webpage.